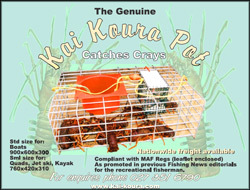 Kai Koura Craypots are a New Zealand manufacturer of cray pots for the recreational fisherman. The marvellous pots are designed and built to last. They stack easily within a small boat, have rounded corners to prevent damage to your boat and vehicle, and are galvanised preventing rust. The bait container is easy to use.